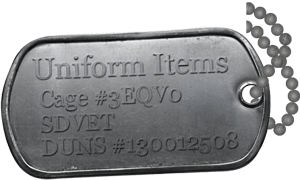 Uniform Items is a service connected, retired, small disabled veteran owned business that employs retired military for their knowledge base. Proud of our past and excited about the future, we are setting the standard as the best choice for America's Warriors as they serve globally or here at Fort Knox. Uniform Items surpassed a milestone of having served 45,000 customers since 2010.